Just over 5 million viewers watched the MTV Video Music Awards on the main network Sunday night—a new low that dates to 1994, when MTV began using Nielsen to track its audience levels, and down 3 million viewers from the 2014 show. All in, the VMAs drew 9.8 million viewers across 10 Viacom networks. That's also down from last year's 10.3 million who watched on four networks: MTV, MTV2, VH1 and Logo. The VMAs were the No. 1 awards show on cable this year in MTV's desired demographic—people ages 12 to 34. More importantly for MTV (and certainly for Twitter), the VMAs were the most-tweeted nonsports program since at least October 2011, when Nielsen Social began tracking Twitter TV activity. In the U.S., 2.2 million people sent 21.4 million tweets, up 69 percent from last year. The most-tweeted minute came at 10:49 p.m. ET, when Kanye West announced he's running for president, prompting 247,525 tweets. The biggest draw on cable Sunday night was the second installment of Fear the Walking Dead, which was up against the VMAs and drew more than 8 million viewers on AMC. Last Sunday's 'Dead' debut drew 10.1 million. 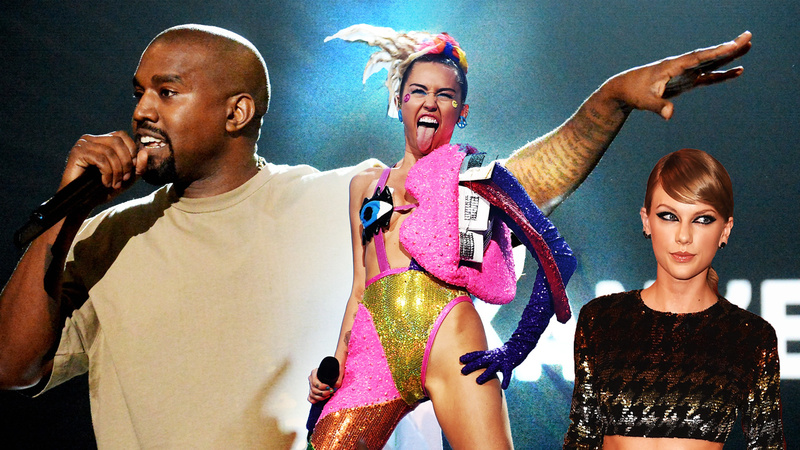 Now 32 years old, the VMAs are at the top end of MTV's target demo. Viewership peaked in 2011, the year Katy Perry took home three awards and Beyoncé announced she was pregnant with her first child, with 12.4 million viewers.